How Are Settlements For Slips and Falls Cases Determined? There are a lot of reasons someone might slip and fall, whether they're out shopping or running errands or find themselves slipping and falling in the workplace. Even a seemingly minor slip and fall can lead to serious injury that costs time and money in doctor's visits, medical treatment, and potentially even time off work to allow the injury to fully heal. If someone is injured as a result of slipping and falling in a public place or the workplace, the owner of the property the injury occurred on, or the business owner, may be liable for those injuries. In the case of an on-the-job slip and fall injury, individuals filing a Workers' Compensation claim may be able to recover costs associated with treatment for and recovery from their injury. How Are Settlements for Slips and Falls Determined? Who is the party ultimately liable for the incident and resulting injury? In what way did the liable party contribute to the incident? Did the injured person contribute to the incident in any way? Answering these three questions will be the basis for any determination of settlement related to a slip-and-fall injury. How Does Negligence Factor In? Negligence, or the disregard for the safety of another by failure to act as a reasonable person would, seems fairly straightforward. When it comes to holding a person or entity liable after injury due to a slip and fall, however, how negligence is factored into determining a slip and fall settlement can be complex. The most important attribute that will be factored into the settlement decision is whether or not a reasonable individual would have been able to identify the condition or situation as potentially hazardous, as well if they had the opportunity to improve the condition or situation prior to the person or people becoming injured. Alternately, you may also be able to prove the liable person or entity specifically caused the dangerous situation and that it would be understandable to any reasonable person that someone would suffer an injury as a result. In the case of injury due to a slip and fall, the injured person has the responsibility of proving the liable party could have taken an action that would have prevented the injury but failed to do so. In order to prove liability, the person or entity in question must have a legal responsibility for the property and any injuries that occur on that property. Normally, this person or entity would be the property owner or business owner, unless they maintain an insurance policy that relieves them of liability in the event of injury. If the property owner or business owner has liability insurance, the injured person would be seeking compensation for their injury from the insurance company and would file suit against them instead. What If Someone is Partly Responsible For Their Own Injury? If the injured person contributed to the slip and fall in any way, they will likely be found at least partly liable. South Carolina recognizes what is called "comparative negligence" — as long as the injured person can prove that the property or business owner was liable to a greater degree than they are, they will still be able to seek recovery after a slip and fall injury. They'll be ordered to accept a portion of liability commensurate with how much their actions affected the outcome, negating assumption of full responsibility by the property or business owner. This means the injured person may find that the amount of recovery they receive is lessened due to their own liability. Some other states do not allow individuals to seek recovery if they themselves were even partially responsible for an injury, so you'll want to speak with a legal professional if your injury occurred in another state. 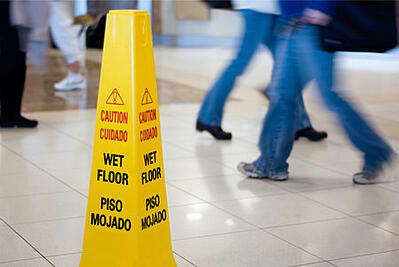 Have You Been Injured As a Result of a Slip and Fall? Whether your injury occurred on the job and you need to file a Workers' Compensation claim, or you were injured after a slip and fall in a public place (such as a business or restaurant), you may be able to seek recovery for the pain and injury you have suffered. At Bluestein Attorneys, we are dedicated to representing the individual rights of our clients, and we'll fight by your side. Speak with a legal representative about your slip and fall injury today by calling (803) 779-7599 or contacting us online at any time.